Taiwan might easily have become a colony but didn’t because of the immigration of hard-working, land-hungry farmers from the mainland and the military competence of Cheng Cheng-kung. more than 300 years or another Dutch East Indies held by the Netherlands for 350 years. The island was oc­cupied and fought over; yet it never was really a colony. China’s grip was too tight. Besides, the Europeans wanted a trading base rather than a settlement. All that remains of the Spanish is an old fortress at the rain-whipped northern tip of the island and some narrow, shuttered windows in the fishing port town of Tamsui. The Dutch left a slightly larger legacy – a fort in Tainan, now the second largest city in the south, and another citadel nearby. Here and there the ex­plorer of the past may come across the ruins of a fort or a church – Catholic for the Spanish, Protestant for the Dutch. That’s about all, although some people point to the glint of red in the black hair of a number of islanders and recall the “red beards” of long ago. Except for a few Chinese and the aborigines who came from the south, no one knows exactly when, the Portuguese were the first on the Taiwan scene. They had established their tiny colony of Macao on the South China coast in 1557 as the first European set­tlement in the Far East. A generation later, in 1590, Portuguese mariners landed on the northern coast of Taiwan and gave the island the European name it still bears – Formosa, which means “beautiful” in the language of Portugal. However, the Portuguese stay was to be brief. At about the same time – 1595 – the Dutch were starting to move into Java. A Dutch trading mission was established in Japan early in the 17th century. The Netherlands then began to feel the need for a posses­sion midway between the Japanese and East Indies ar­chipelagoes. The first Dutch stop was the Penghu is­lands (Pescadores) off the southwestern coast of Tai­wan. From there the Dutch moved to southern Tai­wan in 1624. The island was a fair prize without any effective means of defense. Aborigines had held the area that was taken over by the Dutch. Within a few years, Dutch military forces and officials were augmented by merchants, craftsmen and missionaries. For those times, Spain’s reaction to the Dutch move was quick. The Spanish, who fought from 1568 to 1648 to reimpose their control over the Netherlands, feared an outflanking of the Philippines. In 1626 they occupied the northern tip of the island. They called Taiwan’s northeastern cape Santiago, a name that has come down to today in Chinese as Santiaochiao. Subsequently they moved their forces westward to the Keelung area and built Fort San Salvador on an island in the harbor. Three years later they established Fort Santo Domingo on a hilltop overlooking the northwestern port they called Castillo, now Tamsui. This became their principal settlement. 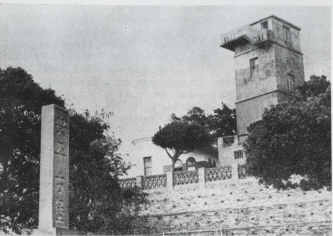 The fort still exists as part of the consulate properties of Great Britain. The Dutch made repeated attempts to throw the Spanish off the island. Castillo and Fort Santo Domingo were heavily attacked in 1630 and 1641. The Spanish held out. But in 1642 the Spanish were threatened by Filipino uprisings and recalled most of the Taiwan garrisons. Dutch troops landed at Castillo and took Fort Santo Domingo. Except for Catholic missionaries, whose influence lingered on for many years, that was the end of the Spanish period in Taiwan. For the next two decades, the Dutch were free to develop Taiwan as a way station for their Far Eastern trade and to encourage farming of the fertile plains. Sugar, which was in demand everywhere, was the crop they favored most. The first Dutch fort – Zeelandia­ – was at Anping on the southwestern coast. In 1650, the capital was moved to newly completed Fort Prov­idential in the heart of what is now Tainan. At the height of the Dutch occupation period, the garrison numbered 2,200 and there were 600 Dutch officials and other civilians. As in what is now Indonesia, the Dutch East Indies Company was the power behind the armed forces. The governor was appointed by the company, which had full power to rule and to tax. The Dutch found the Taiwan aborigines were easily converted to Christianity but that they made indifferent farmers. Chinese immigration at first was encouraged to provide a more productive agriculture. Ownership of land re­mained in the hands of the company, however, and this was to lead to unreconcilable conflict between Chinese settlers and the Dutch. By 1650, there were about 300 Chinese villages under the administrative control of the Dutch East Indies Company. Every 50 households was under a chief. Every 30 to 40 chiefs chose a captain who was responsible for the maintenance of law and order. These positions were unpaid. In the beginning the system worked well enough. Many of the Chinese were refugees from unsettled times on the mainland. The Ming dynasty was in its dying days and the star of the Manchus was nearing its ascendant. Japanese pirates were ravaging coastal areas of South China. There were Chinese pirates, too. The Dutch dictatorship seemed a welcome change to many who fled continental China. Seven aborigine districts were established, each under a chief. The seven chiefs constituted an ad­visory council. The Dutch had a certain astuteness about primitive peoples that was exemplified in their purchase of Manhattan island from the American In­dians for 60 guilders (the equivalent of US$40 today) worth of glass beads and gimcrackery. The staffs of authority they gave to the aborigine chiefs had silver heads ornamented with the company’s coat of arms. It was important to keep the aborigine tribes in line. They outnumbered the Chinese, not to mention the Dutch. Gifts were cheaper than enmity and headhunt­ing. The European lowlanders made it a point to honor aborigine elders with words and tinseled gifts at the same time they were pushing the noble savages into the mountains. Their motive was selfish, but the Dutch must be credited with introducing to Taiwan the draft cattle that are still beasts of all work. Before the red beards came, plows were those of the typical primitive agri­cultural community – sharpened stones attached to a wooden handle. The Dutch East Indies Company brought more than 100 head of cattle from India in the 1640s. Livestock experts supervised breeding and increased the herds. Principal crops were sugar cane, rice, wheat and tobacco. The Dutch were soldiers, merchants, tech­nicians, teachers, and missionaries. Farmers stayed home. Because of the agricultural backwardness of the aborigines, the Dutch were compelled to encourage Chinese immigration. The Chinese population in­creased by about 100,000 during the period of Dutch occupation. Hard-working mainlanders came without anything except two strong hands and their agricultural know-how. That was enough. The Dutch East Indies Company lent land, seed, money and draft cattle. The company also took most of the profits and allotted the land on a basis of the farmer’s enterprise. Dutchmen were hard-headed administrators. They wanted colonies to pay their own way and more. Taiwan was no exception. Taxes and trade were the basic sources of income. Agricultural taxes were exacted on a basis of the quality of the land: poor, fair and good. The amount was high. Taxes were reduced later in the century when the control of Tai­wan passed into the hands of the Manchus. Taxes also were levied on the company’s investments. Defense fees were assessed for protecting Chinese farmers from the aborigines. A head tax was levied on each inhab­itant upon reaching the age of 7. Aborigines were permitted to pay in deerskins. Hunting and fishing were licensed and taxed. Trade was free before the coming of the Dutch, although there wasn’t much of it. Commerce boomed in the mid-1600s and the Dutch exacted their per­centage of the prosperity. Exports of deerskins and sugar were taxed. For that time, the volume was high – from 40,000 to 50,000 skins and around 5,000 tons of sugar annually. Goods went out from Taiwan to Japan, China, the Dutch East Indies and Persia. With Taiwan as the trading base, the company sold sugar, rice, rattan, deerskins and deerhorn to China in return for silk, porcelain and herb medicines. Silver ob­tained from Japan was used in the China trade. From the Dutch East Indies came spices, amber, tin, lead, cotton and opium – products that subsequently were traded to China or Japan. To Persia went sugar, rice and camphor from Taiwan plus copper from Japan and ginseng from China. 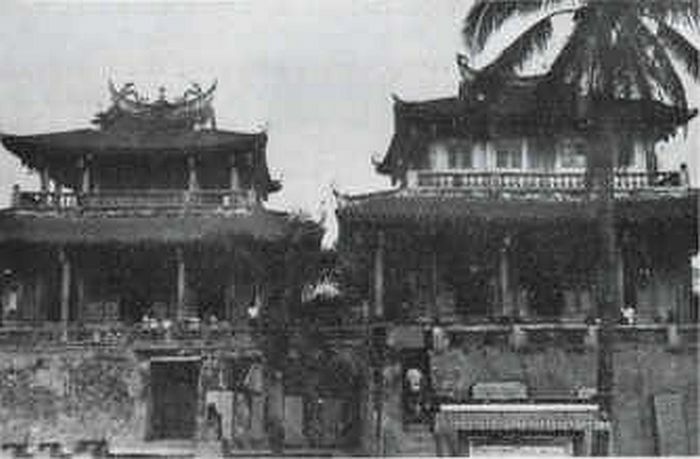 The Taiwan station was one of the Dutch East Indies Company’s most profitable branches. In 1664, for example, the Ceylon and Siam branches showed no profits. But Taiwan earned 26 per cent of the com­pany’s profits and Japan 39 per cent. Missionaries constituted the bureaucratic and control core of Dutch administration. They were in closest touch with the people – both Chinese and ab­origine. They collected taxes and rents and pacified the aborigines with Cross and Bible. Schools were opened to teach the Dutch language and Christianity. The first Dutch missionary reached Taiwan in 1627. He was the Rev. Georgius Candidius, whose name later was given to what now is called Sun Moon Lake. Older European maps still show Lake Candidius in central Taiwan. His book A Short Account of the Island of Formosa was published in Germany and re­counted something of the culture of the island in the early 17th century. The Rev. Robertus Junius worked on Taiwan from 1629 to 1641 and converted nearly 6,000 ab­origines. He established primary schools in aborigine villages beginning in 1636. Each grade had some 30 pupils. Subjects were Dutch reading and writing, Bible and arithmetic. Later he wrote a book on the ab­origine language. Many Dominicans came to Taiwan in the 16 years that the Spanish held the north. Father Jacinto Esquival wrote a book on the language of the abo­rigines. When the Italian Dominican Vittorio Ricci visited Taiwan in 1662, he found that some of the aborigines were still practicing Catholics, although the Spanish missionaries had been expelled in 1642. The Dutch Protestants tried hard to wipe out the influence of Rome. Gospels of Matthew and John were translated into the aborigine language by the Rev. Junius. The Rev. Gilbertus Happartius compiled his Oriental Language Dictionary. Missionaries did their work well. Although the last Dutchman left the island in 1662, a Jesuit father who visited Taiwan in 1715 found that some aborigines could still speak and read Dutch and still treasured fragments of a Dutch Bible. In the 19th century, the Presbyterian missionary Dr. William Campbell found a Dutch Bible in the posses­sion of an illiterate gardener. Christianized aborigines took Dutch names, adopted the Dutch language and wore Dutch dress for the Sabbath. Some of these customs endured for many years. Dutch names remained in existence long after those who bore them had lost knowledge of the der­ivation. On the whole, the Dutch were more successful in winning over the aborigines than the Chinese. The first people of Taiwan had a more primitive culture than those who were immigrating from the mainland. They had no agricultural tradition and no great hunger for the land. They hunted and scratched out a living. Arriving Chinese clustered together in villages for safety, worked the land and pushed the aborigines back into marginal lands, the foothills and eventually the high mountains. Sino-Dutch relations were peaceful enough at first. Chinese farmers began pouring across the Straits of Taiwan from Fukien to find a better, more peaceful life. The Dutch provided security against the abo­rigines and the Chinese raised some of the crops the colonizers wanted. The land was lush and largely untouched by the plow. Usually the Chinese came with empty hands. Implements, oxen, seeds and other instruments of capital came from the Dutch, who also paid for the irrigation and flood control works. Taiwan agriculture was a going concern from the very begin­ning. However, the Dutch East Indies Company re­tained title to the land. Chinese were tenants and they paid both large rents and heavy taxes. As soon as the newly arrived Chinese began to prosper, they petitioned for the right to buy the land. The Dutch would have none of it; they reasoned that control and a larger share of the profits went with ownership. Conflict also arose about crops. The Dutch found that sugar was an ideal medium of trade. They wanted the Chinese farmers to raise more sugar cane. Tradi­tionally and to serve their own needs, the Chinese wanted to grow more rice. Despite the tight hand of Dutch control, the area of rice paddies was three times that of cane fields by 1650. The head tax also was a source of Sino-Dutch friction. Dutch authorities became less and less enthusiastic about the Chinese im­migration they had at first encouraged. But control had largely passed from Dutch hands. Cheng Chih-lung, the Chinese pirate-sea captain and the father of Cheng Cheng-kung (Koxinga), used his ships to transport thousands of Chinese Hakka people from Fukien to Taiwan. In the last three-quarters of the 17th century, about a third of the Hakkas of Fukien and Kwangtung were resettled in Taiwan. Cheng’s pirates even set up a government of sorts where Dutch authority was silent. One historian wrote: “So admirable was the organization that the different bands lived together without discord and chose their leaders by vote, while a supreme chief was appointed to look after the interests of the combined bands whenever anything arose of common interest.” Cheng is said to have controlled between 20,000 and 25,000 Chinese on Taiwan. Cheng Chih-lung worked for the Dutch as an in­terpreter at one time but later sought to break their hold on Taiwan. He had to bide his time for many years. The Dutch were strong in naval power. Tai­wan Governor Hans Putmans ordered an attack on Cheng’s fleet in 1633 and destroyed part of it. The Dutch East Indies Company had decided to use force to expedite the expansion of trade with the Chinese mainland. Governor Putmans wanted to establish a trading agency at Foochow and offered the Ming rulers can­non and soldiers to fight the Manchus. Dutch ships blockaded Amoy while the answer was awaited. Cheng’s response was an attack on the blockaders. Putmans’ force was routed and driven across the Tai­wan Straits. The governor then agreed to Taiwan trading visits by junks under Cheng’s control. More migrants flowed across the straits, especially to north­ern and central Taiwan. In the last years of their hold on the north, the Spanish seem to have offered no ob­jection to Chinese settlement. Like his son, Cheng Chih-lung was an ardent ad­vocate and defender of the Ming dynasty. He was captured by the Manchus and taken to Peking. At first the invaders treated him with courtesy and made lavish promises, hoping to gain control of his fleet. How­ever, it was the son, Cheng Cheng-kung, who had come into command of the ships, and he attacked the Man­chus at Nanking and then at Amoy. Cheng Chih-lung and two sons who had accompanied him to Peking were put to death by the Manchus. History had ordained Koxinga’s invasion of Taiwan and the expulsion of the Dutch. Cheng Cheng-kung had fought futilely against the invaders from the north. He decided to make Taiwan his base for continued efforts to restore the Ming dy­nasty. From the Chinese of the island he learned that the Dutch military had been spread dangerously thin and began to prepare his fleet for action. Governor Coyett learned of the Chinese plans and sent urgent messages to Batavia demanding reinforcements. From their Far Eastern headquarters, the Dutch dispatched Admiral Jan van der Laan with a fleet of 12 ships and instructions to go first to Taiwan. If he found the island in no danger, he was to attack the Portuguese at Macao. The admiral, who earlier had quarreled with Governor Coyett, decided that Taiwan was safe enough, then returned to Batavia for more ships and men with which to attack Macao. The Dutch authorities took Admiral van der Laan’s advice and sacked Governor Coyett. Hermanus Clenk, who had boasted that he needed only three ships and 2,000 men to defend Taiwan, was named the new governor. Cheng Cheng-kung left Amoy with 1,000 junks and 25,000 men in February, 1661. Stopping briefly in the Penghu, he prepared final plans for the attack. The Taiwan landing was made at night seven miles north of Fort Zeelandia. Fort Providentia was given up without a struggle. The much larger and stronger Fort Zeelandia held out for more than six months, then surrendered. For those times, Koxinga’s terms were generous. The Dutch governor, his garrison and his official follow­ing were permitted to leave for Java in 1662 and to take their records, money and movable property. The Dutch attempted to reconquer the island a year later. Keelung was taken by a Dutch fleet and held for two years. But the red beards were never able to penetrate very far south. The island finally was given up as not worth the trouble involved in trying to retake it. Two generations is not a long time in man’s history. The Japanese were in Taiwan for almost that long and left less than 25 years ago. Yet as can be seen in the Taiwan of today, Japanese influences are fast disappearing. Even the language will be gone in another generation. Yet in its time the Japanese im­pact was all-pervading. The Dutch were in direct contact with relatively few of the people of Taiwan. Only the missionaries really got out into the coun­tryside. In the case of both the Dutch and the Spanish, the strongest legacy is the inclination of the people of Taiwan – Chinese as well as aborigines – toward Christianity. The Christian faith never entirely died out among the aborigines. In today’s population of nearly 14 million, the number of Christians is rapidly approaching a million with an approximately equal divi­sion between Catholics and Protestants. Proportionate to population, Taiwan has more Christians than the mainland of China. The missionaries left the spirit of their faith along with the ruins of their churches. The Dutch can be remembered, too, from some of the irrigation works of the south, from the oxen that they imported and which only now are starting to be replaced by power tillers, from the well-preserved ruins of Zeelandia and Providentia, and from some strange sounding Chinese words whose Dutch origin is not guessed by most of those who speak them. Interestingly, the land problem – which was the root of the biggest difference between the Dutch and the Chinese – was not solved during the early Chinese period or the Japanese era from 1895 to 1945. Not until the island reverted to the Republic of China was land reform undertaken and concentration of owner­ship broken up. Although none of the credit can be given the Netherlands, visiting Dutchmen of today should be pleased by the neat, highly productive farms of Taiwan. As land consolidation breaks up the plots into a more orderly pattern, the island’s countryside is taking on a look not so different from the farms of Holland. In the end, the non-legacy of Taiwan is more attractive than the inheritance that the Dutch prepared for the Indonesians. The implication, perhaps, is that a brief period of alien settlement is a good deal less harmful and more pleasant to recall than a long one. Taiwan can be thankful that the Dutch didn’t move into the island in strength, as they did into the Dutch East Indies, and that a Chinese, Cheng Cheng-kung, decided the island could be made into a bastion for the restoration of Ming rule.